Google’s AIY Voice Kit has proven to be very popular in recent times. With the first batch selling out in a few hours. So why are kits like the Google AIG Voice Kit so popular? What makes them so effective? Firstly, in recent years, smart home tech is appearing in more and more homes as it becomes increasingly accessible and advanced, with tech giants like Amazon and Google leading the race to dominate the AI assistant market. Before Apple’s Siri was released, no one had much faith talking to their tech. Secondly, the Google AIY kit is very affordable. Compared to the retail prices of Google Home or Amazon Alexa, the Google AIY Voice Kit is a cheap DIY alternative at a measly $25. However, the lower price tag inevitably comes with its setbacks. The AIY voice kit essentially has the same functions as the AI speaker, but it is apparent that it is not a premium device. Also, a proportion of users have reported unsatisfactory performance. 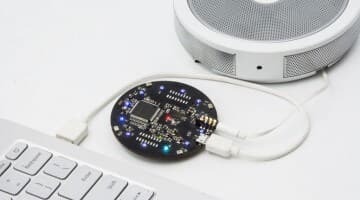 The front of the device consists of a simple unidirectional two microphone receiver circuit, and the success rate at not-so-far distances is poor, not ideal for a smart home speaker. By going up the price ladder a little, AI fans can try the ReSpeaker Mic Array by Seeed Studio. The ReSpeaker Mic Array also works with a Raspberry Pi to provide a smart voice interface and comes with built-in voice algorithms. The latest version, ReSpeaker Mic Array v2.0, has 4 high-performance microphones and supports far-field voice capture up to 5 meters away even with background noise. More than enough for a typical household ruckus. The four microphones are positioned equidistance to each other and face outwards to capture sound data from 360 degrees. Beamforming technology allows the device to identify and focus only on the source and noise suppression helps remove background chatter and provide a crisp recording. Finally, voice quality is improved with the help of de-reverberation and full duplex AEC (Acoustic Echo Cancellation) techniques. Version 2 utilizes the XMOS XVF-3000 chip which allows the number of microphones to be reduced, and therefore reduce cost, while at the same time improving performance compared to v1.0. Build your own customized smart speaker with Google Assistant using a Raspberry Pi 3B+, your choice of speaker and a ReSpeaker Mic Array v2.0 from Seeed Studio today. Raspberry Pi 3B and ReSpeaker are both available online through the Seeed Bazaar. Check it out now. Next post Calling all Badge Enthusiasts - Gather for Seeed's Badge Sponsorship 2019!